The Stewards of Change Institute’s new InterOptimability Training and Certification program incorporates the knowledge. ITCC incorporates the knowledge and tools accumulated over the past decade through our work with thousands of HHS leaders, academic partners and industry experts. It is designed to prepare your workforce – executives, program managers, supervisors and case workers – to achieve 21st Century learning standards. InterOptimability (think Interoperability + Optimization) is a unique methodology we created to build competencies to meet the demands of an increasingly complex, interconnected field. This methodology is at the heart of ITCC, which offers “training on demand” through its state-of-the-art, web-based platform. 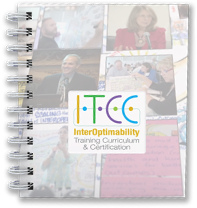 ITCC includes certification of each of your trained personnel as an InterOptimability Professional Expert (IPE) – and, more broadly, it enables your organization to prepare for the convergence of programs that span the HHS continuum and help you build capacity to embrace the Social Determinants of Health and Well-Being. We are excited by the doors ITCC will open, the connections it will enable you to make, and the good that it will do. Most of all, we hope – and believe – it will lead us on a journey, together, to a healthier and more equitable world. ITCC uses knowledge and tools – developed through our work over the past decade with thousands of HHS leaders, academic partners and industry experts – to enable you to achieve 21st Century standards and practices. ITCC is designed to help accelerate your organization’s readiness for change. It uses a state-of-the-art, web-based platform that provides “training on demand” – including about the vital role of the Social Determinants of Health and Well-Being.